› Author Affiliations Funding This work was supported by grants of the state initiative ‘health economy’ of the Ministries of Health and Economics, Rhineland-Palatinate, Germany (grant identifier: AZ.623–1), the Federal Ministry of Education and Research, Germany (grant identifier: BMBF 10E01003), the Center for Translational Vascular Biology (CTVB) of the University Medical Center Mainz, Boehringer Ingelheim Pharma GmbH & Co. KG, Bayer Vital GmbH, Daiichi Sankyo Europe GmbH, Sanofi-Aventis Germany GmbH, IMO Institute GmbH, Portavita BV and the German Heart Foundation. The sponsoring bodies played no role in the planning, conduct or analysis of this investigator-initiated study. Patients with heart failure (HF) are frequently anti-coagulated with vitamin K-antagonists (VKAs). The use of long-acting VKA may be preferable for HF patients due to higher stability of plasma concentrations. However, evidence on phenprocoumon-based oral anti-coagulation (OAC) therapy in HF is scarce. 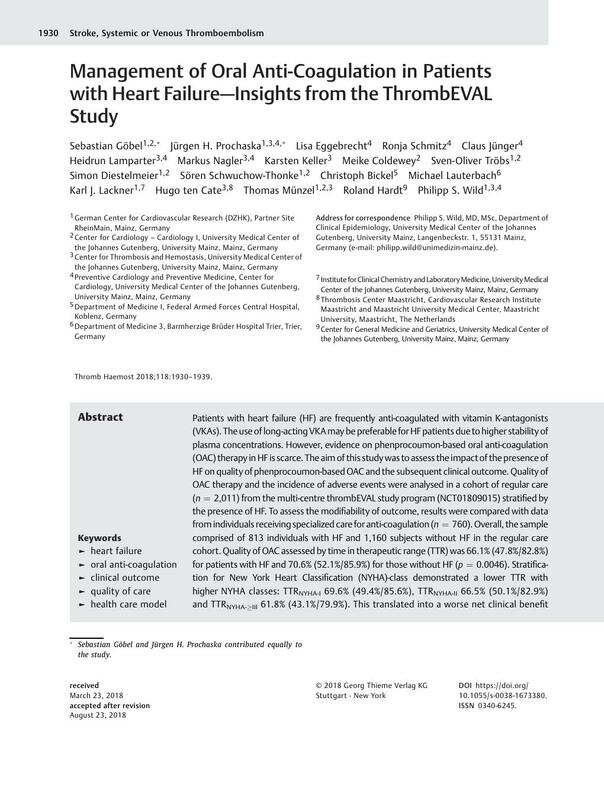 The aim of this study was to assess the impact of the presence of HF on quality of phenprocoumon-based OAC and the subsequent clinical outcome. Quality of OAC therapy and the incidence of adverse events were analysed in a cohort of regular care (n = 2,011) from the multi-centre thrombEVAL study program (NCT01809015) stratified by the presence of HF. To assess the modifiability of outcome, results were compared with data from individuals receiving specialized care for anti-coagulation (n = 760). Overall, the sample comprised of 813 individuals with HF and 1,160 subjects without HF in the regular care cohort. Quality of OAC assessed by time in therapeutic range (TTR) was 66.1% (47.8%/82.8%) for patients with HF and 70.6% (52.1%/85.9%) for those without HF (p = 0.0046). Stratification for New York Heart Classification (NYHA)-class demonstrated a lower TTR with higher NYHA classes: TTRNYHA-I 69.6% (49.4%/85.6%), TTRNYHA-II 66.5% (50.1%/82.9%) and TTRNYHA-≥III 61.8% (43.1%/79.9%). This translated into a worse net clinical benefit outcome for HF (hazard ratio [HR] 1.63 [1.31/2.02]; p < 0.0001) and an increased risk of bleeding (HR 1.40 [1.04/1.89]; p = 0.028). Management in a specialized coagulation service resulted in an improvement of all, TTR (∆+12.5% points), anti-coagulation-specific and non-specific outcome of HF individuals. In conclusion, HF is an independent risk factor for low quality of OAC therapy translating into an increased risk for adverse events, which can be mitigated by specialized care. * Sebastian Göbel and Jürgen H. Prochaska contributed equally to the study.